According to a 2010 census, Flathead Reservation has largest Indian population of any Indian Reservation in Montana. However, since Crow Reservation and Northern Cheyenne Reservation are actually connected, that Reservation has largest Indian population in Montana. However, both are classified as distinct Reservations. According to 2010 census, Flathead Reservations Indian population is 9,328. Mixed bloods make up 2,286 of it's population of 9,328. Mexicans make up 1,021 of Flathead Reservations population which represents Flathead Reservation having an Indian population closer to 10,000. Of course, that's including mixed bloods and Mexicans. This Reservation was supposedly eradicated. Below is a map of Flathead Reservation from 1919 which claims it is a former Reservation. However, chief Rocky Boy was set aside a Reservation within Flathead Reservation in 1904, per treaty agreements from that infamous 10¢ an Acre Treaty which was ratified in 1904. American leaders covered it up. On October 17, 1855 a treaty was signed near mouth of Judith River which is north of Lewistown, east of Great Falls, and south of Rocky Boys Reservation. Blackfeet (they are Chippewa) leaders, Cree (they are northern Chippewa's), Flathead including Kalispel, Pend d'Oreille, and Spokane (they are a mixture of Ojibway and Salish), Kootenai (they are also Chippewa), and Nez Perce who are Amikwa Chippewa's, signed treaty which created a first Blackfeet Reservation (aka Turtle Mountain Reservation) of Montana. It did not include land area where Fort Peck Reservation is located. It extended from mouth of Milk River to main divide or continental divide (Rocky Mountain Trench) of them Rocky Mountains. Musselshell River is it's eastern boundary and part of it's southern boundary, while Yellowstone River in northwest Wyoming, is it's extreme southern boundary. White historians made a blunder by placing main divide or continental divide of them Rocky Mountains, in a wrong place on maps from 19th century and even now. Rocky Mountain Trench is that divides real main divide or continental divide of them Rocky Mountains. Rocky Mountain Trench extends from Yukon, south through middle of Flathead Reservation. 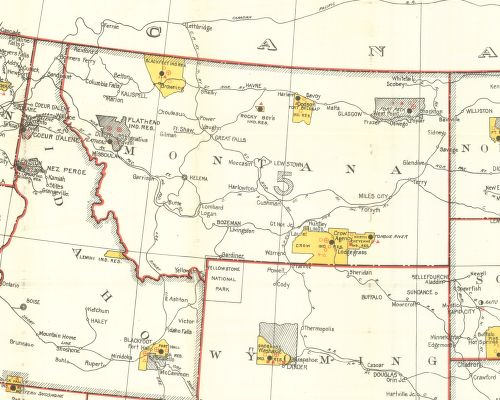 Maps from 19th century, clearly show Blackfeet Reservation extending to that main divide or continental divide of them Rocky Mountains, which means Flathead Reservation is in fact a part of Blackfeet Reservation (aka Turtle Mountain Reservation) of Montana. On July 16, 1855 a treaty was signed near Missoula (Hell Gate Treaty) yet it was actually Americans negotiating with Indian leaders of that part of Montana, to receive permission from them before formally finalizing a signing to treaty agreements which happened on October 17, 1855. Those threaties are known as Stevens Treaties. He lived on and off at Flathead Reservation. Indians who live at Flathead Reservation, don't understand that Flathead Reservation is one of chief Rocky Boy's Reservations. He knew Flathead Reservation was going to be eradicated and fought to keep a portion of it. It deals with that infamous 10¢ an Acre Treaty. Below is information about chief Rocky Boy receiving a new Chippewa Reservation at Flathead Reservation. 1904 was very important to chief Rocky Boy. On April 21, 1904 it was made known, that infamous 10¢ an Acre Treaty was ratified. In 1892, United States negotiators hired 24 Chippewa's to sign McCumber Agreement which is better known as that infamous 10¢ an Acre Treaty. It's fraudulent. However, chief Rocky Boy did in fact agree to accept it. Below is an excerpt from a January 6, 1904 River Press news article about chief Rocky Boy being granted a Reservation within Flathead Reservation. It was set aside per treaty agreements or is a part of ratification of 1892s infamous 10¢ an Acre Treaty, on April 21, 1904. Homes for Rocky Boy's Band. "Be it enacted by the senate and house of representatives of the United States of America in congress assembled, that the secretary of the interior be, and he is hereby authorized and directed, with the consent of the Indians of the Jocko ( Flathead) reservation, in the state of Montana, to be obtained in the usual manner, to set aside a tract of land in compact form within the boundaries of said reservation, sufficient in area to give not to exceed 40 acres each of arable land to such members, including men, women and children, of the migratory band of Indians now roaming in said state, and known as Rocky Boy's band, as shall, upon investigation, be satisfactorily shown to have been born in the United States, and who may desire to settle permanently upon said reservation: and there is hereby appropriated out of any money in the treasury not to exceed the sum of $8,800, or so much thereof as may be necessary, to pay the Indians of Flathead reservation at the rate of per acre for the lands relinquished and set apart for said migratory Indians: and a further sum of $10,000 to be expended in assisting said Indians in making homes for themselves on said reservation, in all $18,800 to be immediately available." You read that their land or Reservation was set aside in compact form. Of course, that means it is a distinct Reservation. Far more than 100 Ojibway's were directly under chief Rocky Boys rule who settled down on their Reservation within Flathead Reservation (aka Jocko Reservation). It involved all Indians who lived at Flathead Reservation in 1904. They lied afterwards by using their press to fib about rejecting Senator Gibsons bill. An agreement had already been agreed to before April 21, 1904s ratification of that infamous 10¢ an Acre Treaty. It involved land in Swan Valley. I suspect where Beaver Creek is and includes Lindbergh Lake, down to Placid Lake, Salmon Lake, Elbow Lake, Harpers Lake, Blanchard Lake and follows a creek or river from Blanchard Lake to it's mouth at Blackfoot River. Swan Valley Massacre happened near Lindbergh Lake which is about 3 miles below or south of Gordon Ranch. It's also known as Holland Ranch. That battle didn't happen at Holland Lake. In October of 1903, Thomas Downs recommended that Chippewa's be allowed to settle at Flathead Reservation. You must remember that Flathead Reservation was already a Chippewa Reservation then. In January of 1904, senator Gibson introduced his bill (S. 2705, Fifty-eigth Congress, first session) to set aside land within Flathead Reservation for Chippewa's led by ogima Rocky Boy. It really included all Indians who lived at Flathead Reservation. They really meant to eradicate Flathead Reservation. Maps from 1870s and after, show Sweatinghouse River or Swan River, well within Flathead Reservations boundaries. A large Chippewa population was living in Swan Valley and what is now Bob Marshall Wilderness Area then. Flathead Reservation Land Act of 1904 was known of and that McCumber Agreement or 10¢ an Acre Treaty was passed by United States in 1904. They needed ogima Rocky Boy's support to prevent violence. What happened on October 18, 1908, was an American assault on a camp of Ojibway's near Lindbergh Lake which is located in Swan Valley. We have proof those Indians were Ojibway's led by chief Rocky Boy. Below is an excerp from NATIVE BUT FOREIGN: INDIGENOUS TRANSNATIONAL REFUGEES AND IMMIGRANTS IN THE U.S.-CANADIAN AND U.S.-MEXICAN BORDERLANDS, 1880, PRESENT. 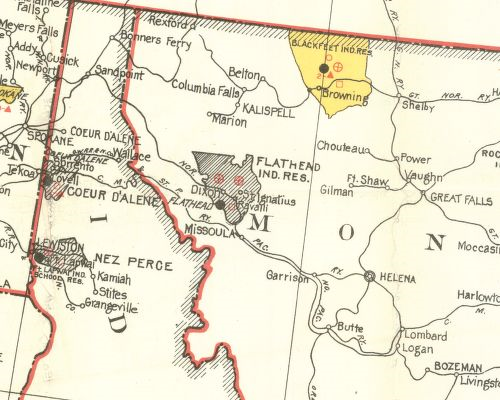 There is also an 1879 map of Montana which shows Flathead Reservation. You'll notice that Sweatinghouse River (aka Swan River) is well within Flathead Reservations boundaries. Swan Rivers mouth is at Flathead Lakes northeastern edge. 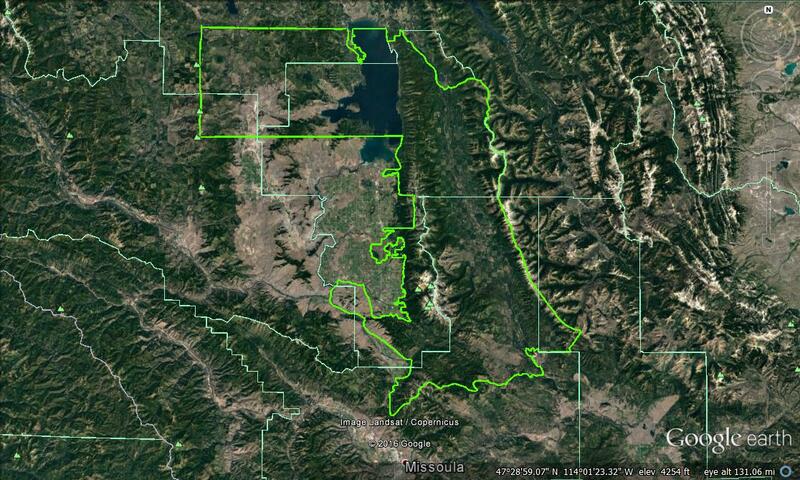 Flathead Reservations boundaries are incorrect. Also look carefully at an area on that map directly west of northern part of Flathead Lake. It is written "N.W. Corner of Flathead Ind. Res." You'll notice it is not within Flathead Reservations boundaries. Chief Rocky Boy knew that United States was going to use force to force Ojibway's to leave for Mission Valley and other Reservations. There were going to be forced to accept land allotments in Mission Valley. Read it very carefully. Here is $30,000 for the Wandering band of Chippewa Indians. I personally know their condition. The matter was investigated two or three years ago. I know they are starving and hungry, dying by the score every year. IT is merely a matter of humanity to purchase land for these one hundred Indians . . . I have on my desk a letter from, written within the last ten days, Chief Rocky Boy . . . The old man thinks this bill has already passed Congress . . . He said, But for this, I and my children, some of them, would be dead before snow flies this fall. A group of supposed Pend d'Oreilles (they were really Chippewa's who were minding their own business or continuing to live in that Reservation American leaders promised them in 1904), were hunting in Swan Valley near Lindbergh Lake, in late 1908. Through treaty agreements, they were allowed to fish and hunt. Those 8 Chippewa's had purchased hunting permits which they showed to that game warden and a deputized citizen who accompanied him. They were off hunting in September and October of 1908. Many others Chippewa's were living near Beaver Creek and Lindbergh Lake at that time or 1908. Charles Peyton (that Game Warden) and a deputized citizen named Herman Rudolph, went looking for Chippewa's who were living in Swan Valley. They found one of their camps in Swan Valley near Lindberg Lake. He demanded proof they had permits to hunt which they did. State of Montana was breaking treaty law. Indians had rights, by treaty, to fish and hunt. Early details of what transpired are possibly correct. deputy game warden here, this morning. their licenses, and that a fight ensued. as it is better known, the Holland ranch. You notice that above map i drew using google earth, of chief Rocky Boy's Reservation? 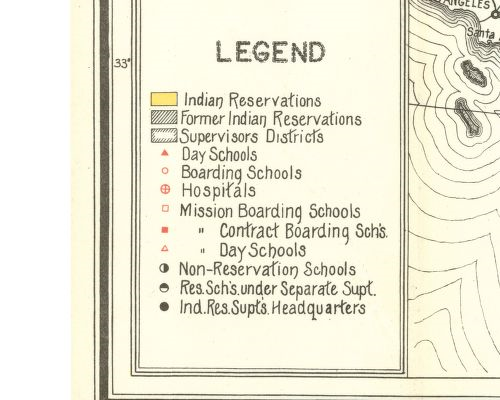 You also noticed those maps which show Flathead Reservation being a former Reservation. That isn't so. Chief Rocky Boy was granted a Reservation there. That be where Swan Valley is which is within Flathead Reservation. On that first map you noticed where Sweatinghouse River (aka Swan River) commences. Swan River commences where Bigfork, Montana is. That means Flathead Lakes northern shores is Flathead Reservations northern boundary. Shanley Creek (aka Cottonwood Creek) a little east of Morrell Mountain, northeast to Monture Mountain, is Flathead Reservations eastern most boundary. It follows a line northwest to Bigfork. From Bigfork, it's boundary extends west to a point 1.5 miles south of Somers. It continues going south along Flathead Lakes northwestern shores, to Flathead County's southern boundary. It then extends west to Highway 93 and follows it northwest to Blacktail Road and Mission Lane. It then extends north to Looking East Drive. It then follows a line west to a point 1.0 miles north of McGregor Lake. It then follows a line south to Thompson Peak. It then extends east to a point 2.9 miles northeast of Finley Point. It then follows Mission Mountains western slopes and foothills south to St. Mary's Lake Road. It then follows those mountains northern slopes west to National Bison Range and goes around it's northwestern boundary south to Flathead River where Jocko Rivers mouth is. It then follows Jocko River to Ravalli and then follows those mountains western slopes and foothills to Jocko River 4.0 miles east of Arlee. It then follows those mountains western slopes and foothills to Flathead Reservations southern boundary and then follows Flathead Reservations southern boundary east to Monture Mountain. Look that first map over carefully. It's from 1876 and it's correct. What happened after Swan Valley Massacre was a major Deportation of Ojibway's. Many were allotted land in Mission Valley, while many were Deported to Blackfeet Reservation and Fort Belknap Reservation. Most were Deported to Arizona and Florida or to Canada. Many were also Deported to North Dakota and South Dakota and Oregon and Washington. Below is a news article from a Friday November 12, 1909 edition of The Daily Missoulian. What is extremely important is those first two lines. TO LOCATE CHIPPEWAS IN BLACKFOOT VALLEY. Where is Blackfoot Valley? It is 22 miles slightly northeast of Missoula. It follows Blackfoot River east, then north, then east to where Ovando is. are about 150 of the Chippewas. Chief Rocky Boy's Flathead Reservation is yet intact. Chief Rocky Boy agreed to cede Mission Valley so Flathead Reservations remaining land (almost all of it is mountainous) remained a part of Flathead Reservation. Chief Rocky Boy's Flathead Reservation is quite large. Below is a list of communities of this Reservation set aside for chief Rocky Boy. Today, only about 100 to 300 Chippewa's are clinging to their tribal idenity at Flathead Reservation. However, at epodunk.com demographics of Lake County put Chippewa's population in Lake County at 1% or near 300. Total Chippewa population at Flathead Reservation may be closer to 400 than 300. That is Chippewa's who are continuing to cling to their Chippewa identity. Chippewa's actually make up a majority of Flathead Reservations Indian population. Chief Rocky Boy moved to Blackfeet Reservation in November of 1909. In 1913, he moved to Great Falls where he was set aside a Reservation adjacent to Great Falls northside. He possibly was yet alive during them 1930s. From what i know about chief Rocky Boy and that bogus Rocky Boys Reservation, is limited. He may have visited Fort Assiniboine Indian Reservation once or twice. He never lived there. Covers: 1,800 sq. mi. - 4,662 sq. km.